Join EO for the Saints & Soldiers tour where you'll visit exciting historical landmarks in Paris and Northern France! In Northern France, you'll visit sites involved in World War II, such as Cherbourg, St. Mere Eglise, Caen and the Normandy Beaches. Pricing starts at $3,998* from New York. The tour departs on May 14, 2019. Depart on your international overnight flight. Arrive this morning in Paris and travel north to Cherbourg for dinner and overnight. Cherbourg was not part of the original D-Day Invasion, but was a key port to control to guarantee the success of holding the beaches and supplying the continued Allied effort. The city fell to the Allies on June 30th. Cherbourg also is a US Civil War heritage site, because of the battle of the USS Kearsarge and the CSS Alabama off the shores of the city. 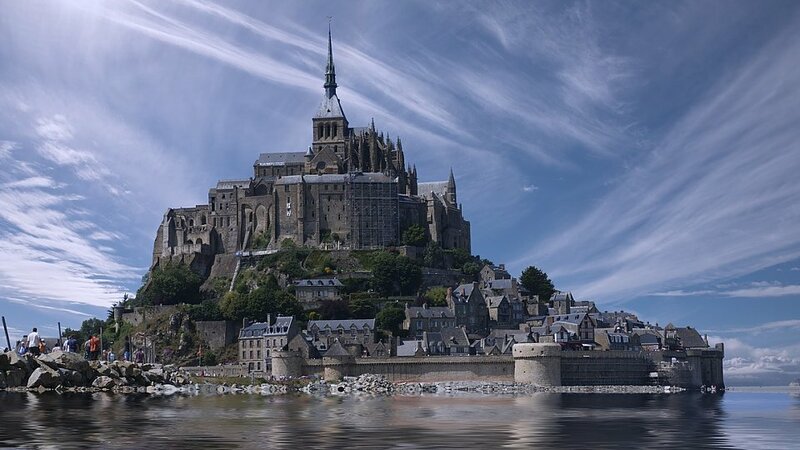 This morning you'll journey to Mont St. Michel, an Island consecrated in 708. It was one of the first places of the cult for the Archangel Michel on Gargans Mount. The abbey presents a big panorama of the medieval architecture from the 6th to the 16th century. Return to your hotel for dinner and overnight. Today walk the town of St. Mere Eglise. Here the Allies parachuted in and began the D-Day invasion. Continue to Pont du Hoc, site of intense fighting as the Allies came ashore. This afternoon, travel to Caen, the site of heavy fighting as the allied forces moved inland off the beaches. The history of the city is reflected in the Chateau de Caen, a castle built by William the Conqueror prior to the Battle of Hastings. Today it houses a museum that reflects its history, including the bullet holes where French Resistance members were shot against its walls. See the Memorial for Peace here. Check into your hotel for dinner and overnight. You'll head for the beaches of Normandy, where on June 6, 1944, Allied forces began the invasion of Europe to liberate it from the grip of Nazi Germany. Visit the D-Day Museum and the cemeteries. Continue on to Bayeux. The Bayeux Tapestry, created for William the Conqueror to commemorate his victory at the Battle of Hastings in 1066 is on display here at a local museum. Notre Dame de Bayeux, built in 1077, was its original home. Return to your hotel for dinner and overnight. Today you'll leave for Lisieux and the Basilica of St. Therese. The second most visited pilgrimage site in France after Lourdes, St. Therese served her simple and spiritual life at the Carmelite Order here, and her writings have gone on to inspire millions. Continue on to Rouen. Claude Monet made this cathedral internationally famous with his paintings in the late 19th century. Also here is the Church of Saint Maclou, where Joan of Arc was threatened with torture in 1431. Finish the day in Paris as you check into your hotel. Dinner is on your own tonight. This morning, You will head to the Ile de la Citie, home to Notre Dame. 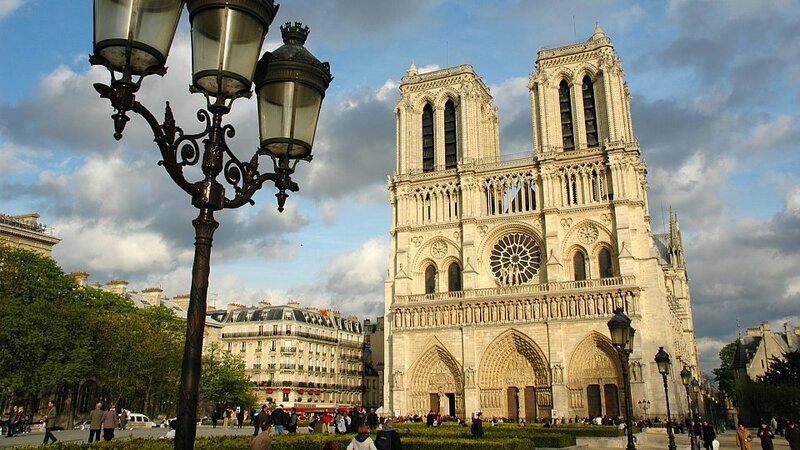 This 850 year old Gothic Cathedral remains the center of the French and their faith. From here, you'll visit Saint Chapelle, the private chapel of kings illuminated with streams of colored light through towering stained-glass windows. Enjoy a panoramic tour of the city, including seeing the Seine, the Champs Elysees, Arc de Triomphe, with a visit to the Eiffel Tower. Then take a ride up the funicular to Montmartre and Sacre Coeur. This cathedral looks out over Paris from the place where St. Denis was martyred. While here, wander the art shops and stores that line the streets here. Return to the hotel, or remain here for dinner and watch the sunset on Paris. Dinner is on your own tonight. Today is yours to explore and shop in the City of Light. For those who want a more structured day, enjoy a train ride to Versailles and a tour of the palace of King Louis XIVth. The palace and grounds are now a national treasure (Optional tour not included in the cost of the tour, $60.00 extra). Return home heartened and enlightened by the people, places and history of France. Enjoy two days on your own in Paris to explore and shop. Your hotel, breakfast and return transfer to the airport are included in your price.